Say hello to this silver beauty! 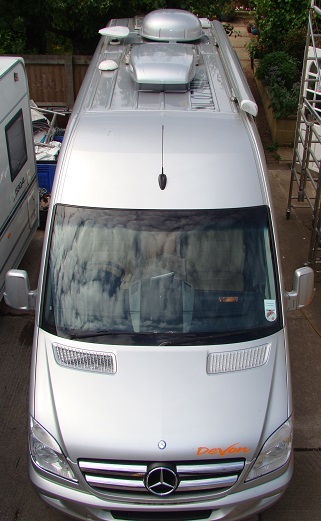 Back in 2010 we installed a Dometic B2200 and a Tracvision R4SL to a Devon panel van conversion campervan. The van itself was a silver Mercedes Sprinter base and the customer was very keen to have everything colour matched to the exterior colour of the van. They were really not keen on having white boxes on the roof. As well as the roof work we also installed a Waeco RVS750 reversing camera system, a Telair ECO Energy TG480 (then known as a Gasperinin EG20) a Kombi plus gas alarm and a cleverly hidden safe (No, we can't tell you where it is!). The Waeco CAM50c camera was easily colour matched as that is available in white or silver. The Air conditioning unit and satellite dome were slightly less straight forward. The standard colour for the Tracvision range is white. At first we thought that we could order a silver R4SL but it turned out to be more of a gunship grey and not the shiny metallic silver we were hoping for. It is also possible to have Tracvision dome's in black as an off the shelf product but obvioulsy that wouldn't match either... 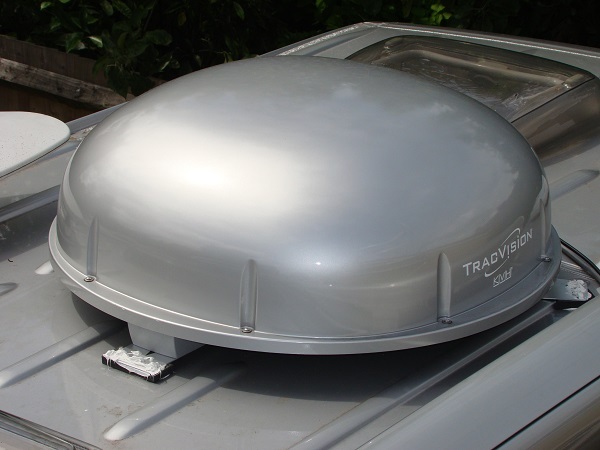 The Dometic roof mounted Air conditioning units are only available in white. We took the lids of both B2200 and the R4SL down to a car spray garage we know locally armed with the Mercedes paint code and they matched the paint colour perfectly. The importers of the domes said as long as the paint was applied thinly there would be no interference on the satellite signal and they were right! The spraying cost was £150 + VAT for the two units, we also got a white logo sticker for the Tracvision, we wouldn't want it mistaken for the competition now would we?! On the subject of colour matching; when installing the generator the only place we could find to position it was where the spare wheel was situated. This was partly becasue there was an underfloor gas tank already installed on the van. Rather than loosing the spare wheel all together we sourced a spare wheel bracket and cover that would usually be installed on the rear of a Land Rover. Unfortunately we couldn't find a silver one but the customer did concede that the black cover actually worked well as it broke up the silver! 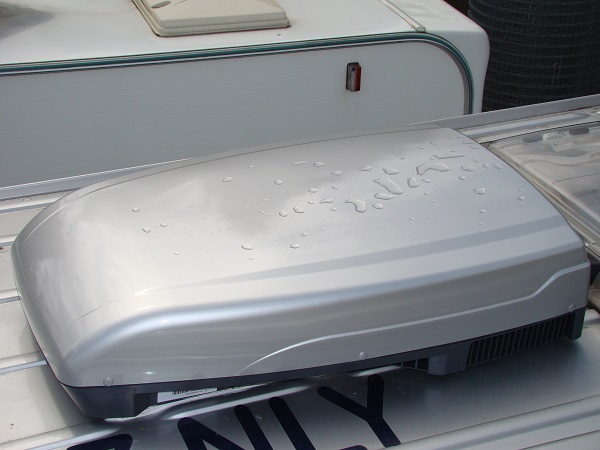 Its not just Domes and Air conditioning that can be sprayed. We have also supplied Freesat with their Oyster satellite dish. They had the satellite dish installed on the roof of a Lexus 4x4 and sprayed black to match the colour of the car (although in this picture taken at Gadget Show live 2012, it appears to be green!) so it can be done to other systems too!